It was my mother's name day recently and on this day the closest of the family gathers together to celebrate it. We usually bring wine and sweets and other small gifts but this year I wanted to mark the occasion with something else, so I made her this necklace. She had no idea what I was making. I just told her to choose the colors. Again I used crochet roses and taffeta rosettes and some glass beads for added charm. I also wrote the pattern down and you can find it here, here and here. 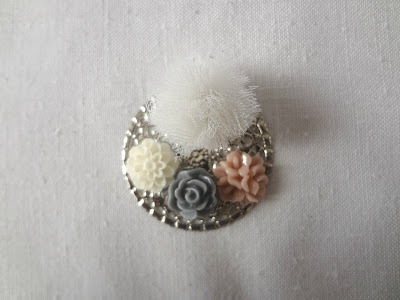 Arrange the flowers in the most attractive way on the lower part of the tray, and add the pom-pom. 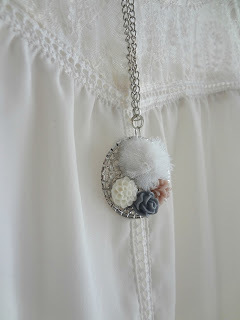 To make the tulle pom-pom I used this technique here. On the upper, center part add 2 jump rings and attach them with the chain and your pendant necklace is done. Hope you make it. Have fun! It has always been my desire to crochet and sew and knit and generally make things for babies and children.Dolls have been on the top on my list - but not being a priority and certainly not the basis for my small business, I just satisfy that desire by drawings and sketches of crochet dolls. 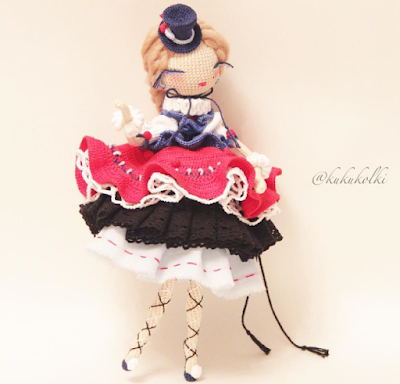 And by following people who make magical dolls. One such extraordinary, masterful artist is Anastasia Goval. 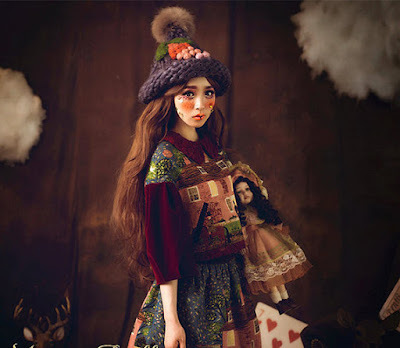 The first time I saw her dolls I couldn't believe one could make such stunning and mesmerizing dolls. 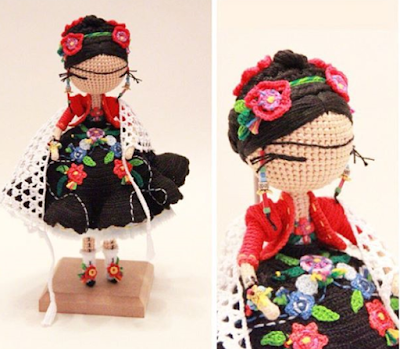 What I like most is the clothes she crochets for the dolls. My Gosh! Those are tiny little masterpieces. I mean, sweet heavens! I would die to have their clothes!! Look at the coat on this girl below. 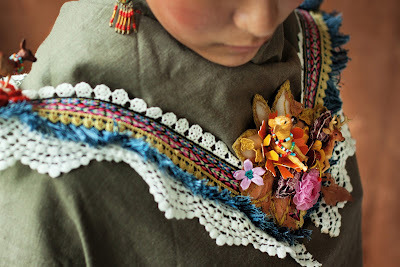 What amazing and impeccable work on all the details! Aren't they amazing?! 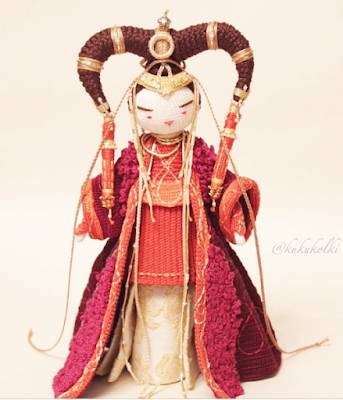 I could swarm up this post with tons of her dolls, but I don't want to ruin the surprise. Go see her work here. 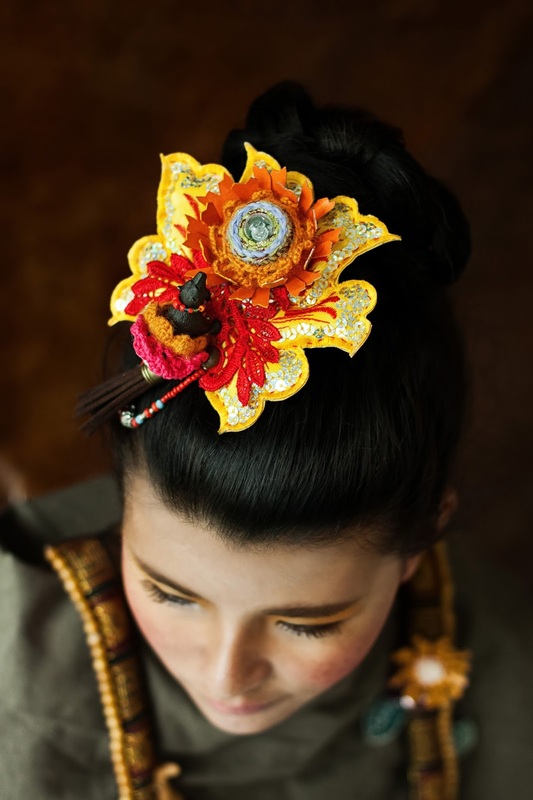 Today we have to show you our newest addition to the Mori collection. 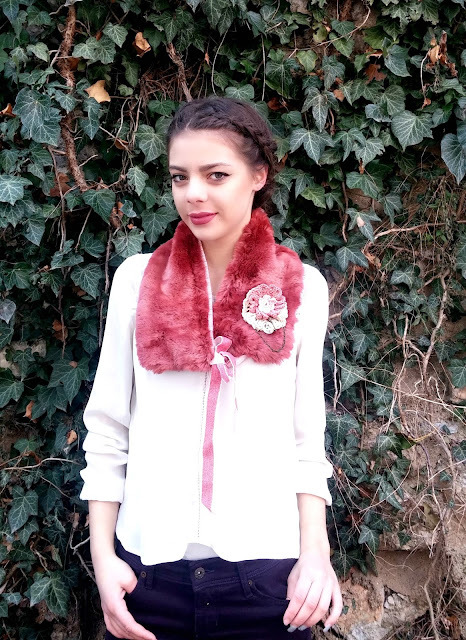 A faux fur collar. 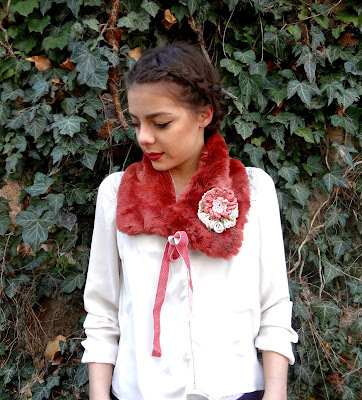 It comes in a seducing coral dust / pink and brings the air of a fairytale. It will make you feel like coming out of a winter wonderland; feminine, seductive and romantic, bewitchingly fascinating with a sprinkle of mystery about yourself. 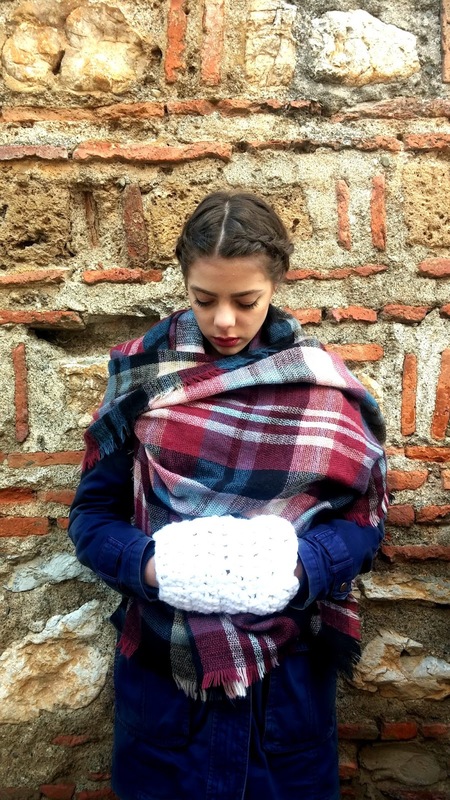 It is the perfect thing to throw over a plain winter coat or a dress. 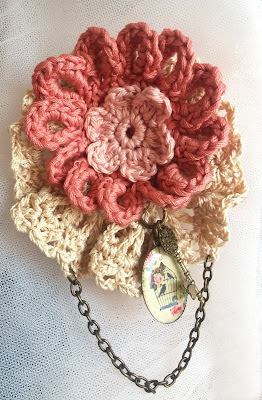 I added a detachable crochet flower brooch adorned with a romantic pendant and a small skeleton key. 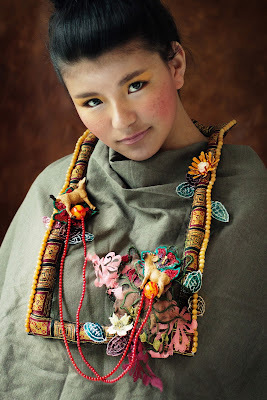 Amazing Textile Art Jewelry - "To Tibet"
While searching for textile art jewelry - I came upon a fantastic artist whose creations have literally left me breathless. Her name is Yanli Duan and the summary of her undergraduate studies is called "To Tibet". 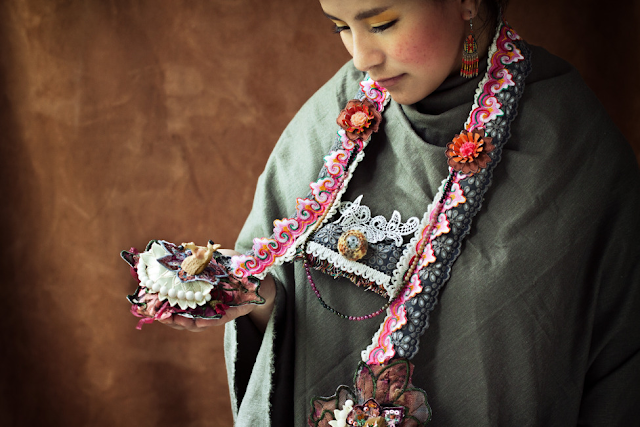 A series of amazing textile art jewelry. 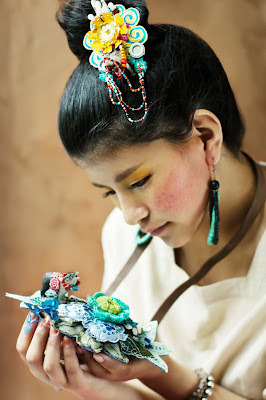 According to her words, she boldly mixes textiles with leather and beads adding LED to show the impact of modernization and its integration with culture and tradition. 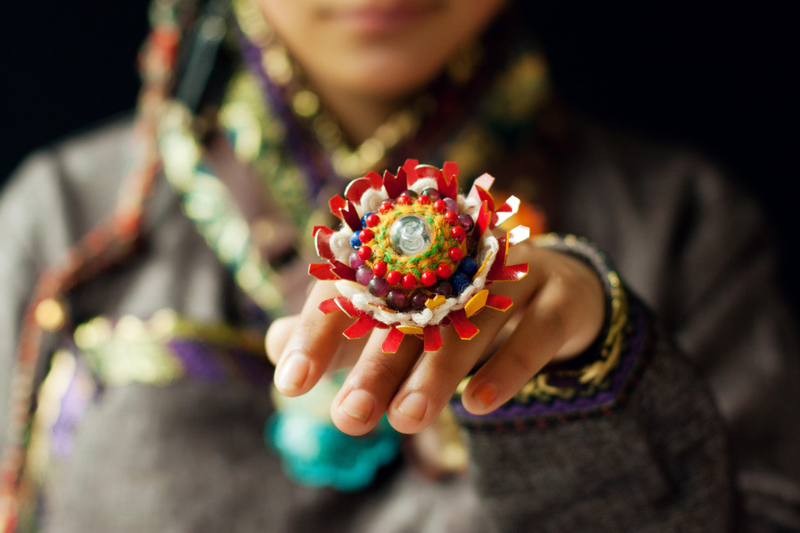 Thus creating contemporary jewelry on the foundation of Tibetan traditional complex patterns and special, mystical designs. 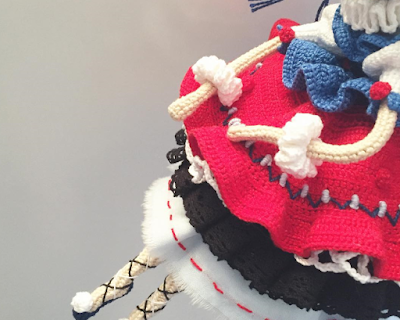 Feast your eyes with her amazing pieces! 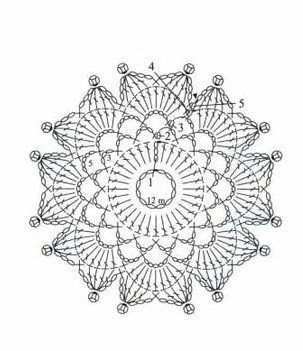 Doilies always remind me of my paternal grandmother. 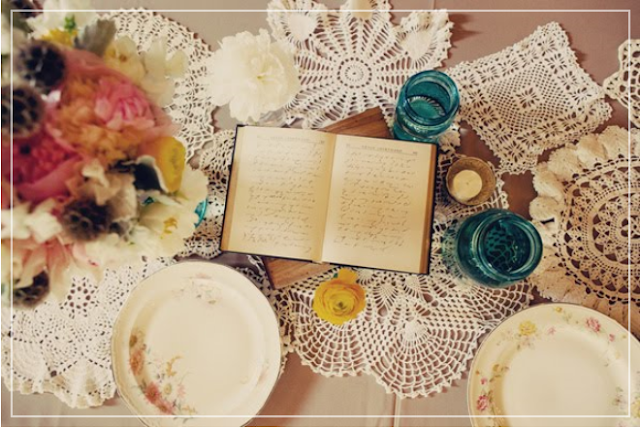 She could masterfully whip up doilies as fragile and delicate as a spider web. She also loved showing and displaying them as much as making them. 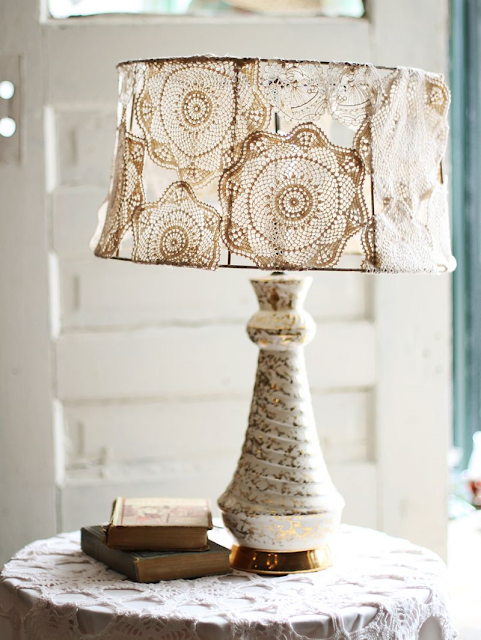 They were tastefully placed around the house to decorate certain corners and points. 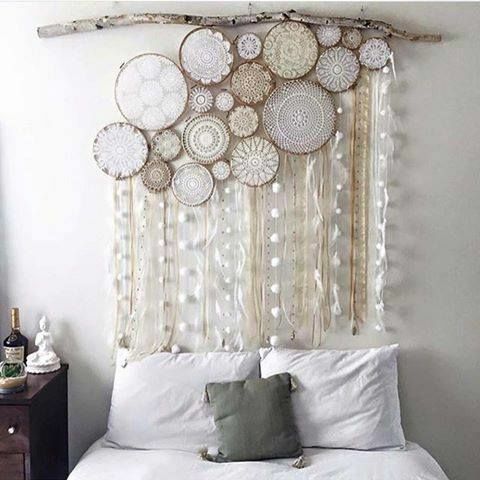 That's where my love of doilies comes from. Being the oldest of her granddaughters, I had the honor of having many tablecloths and doilies made just for me, for my dowry - as she used to say. 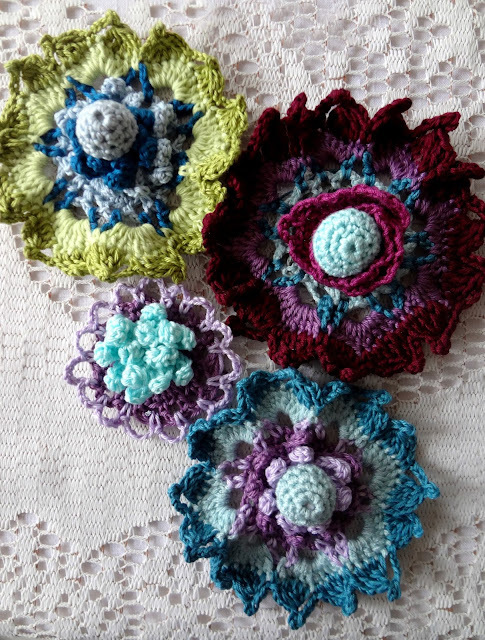 But the dear soul knew that out of us 5 girls, I was the one who appreciated, learnt and enjoyed crochet (and knitting) and that I would use and care about all my doilies passionately. 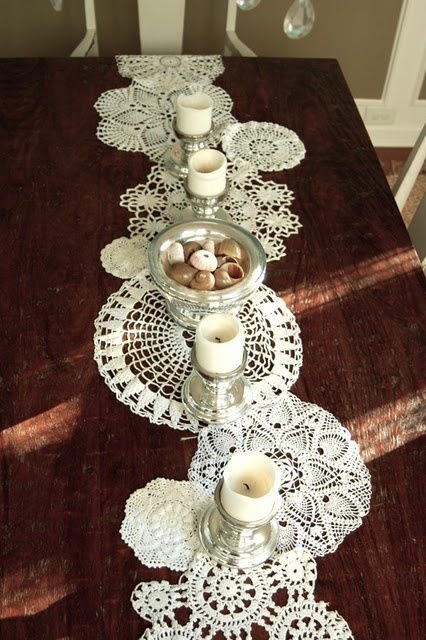 So finding new, interesting ways to use and display doilies has always been pleasurable and fulfilling for me. 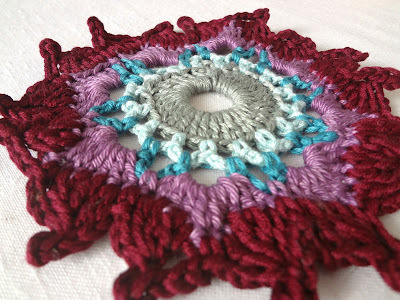 I have found some fabulous ideas for using crochet doilies I want to share today. 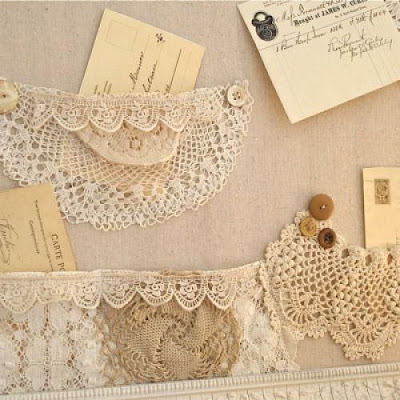 Make a fantastic, bulletin board with a vintage feel. Use the search bar above to see all my doily related posts. On Saturday, at last, it started snowing. We've been fighting pollution for the past several months (one of the disadvantages and curses of living in a big city) so when it started snowing we all got a little bit hilarious about it. Clean air for a while. The snow was the reason more to show you our new muff and share the pattern for it. For the muff I used chunky yarn and 4 mm hook. The chunkiness makes this project finished in about 15 minutes﻿. Row 2: starting from 2nd ch from hook, hdc across. Ch 3 and turn work. Row 3: starting from 2nd ch from hook, dc across. Ch 3 and turn work. Row 4 - end: repeat rows 2+ 3 consecutively. When you achieve the desired length, sew both ends (or sc to join them) together. 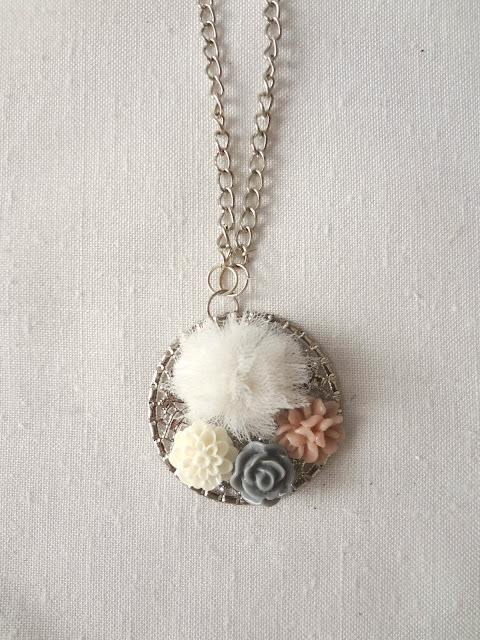 To make the chain: insert yarn on the upper side of the muff and chain "x" no. of stitches. 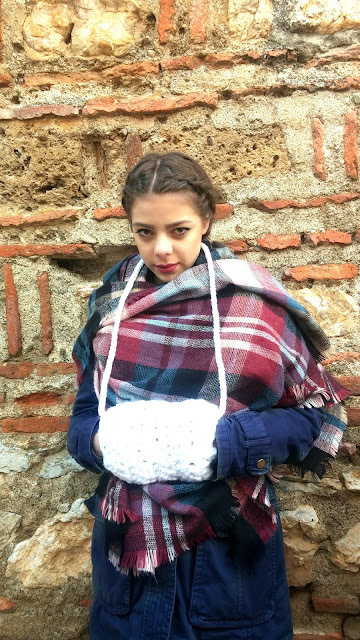 To crochet the right length of the muff chain, measure it on the recipient by placing the muff on the navel. The arms / hands are in suitable, muff wearing position when it is right on the navel. Fasten it on the other side and you are done! Or you can leave it without the chain. 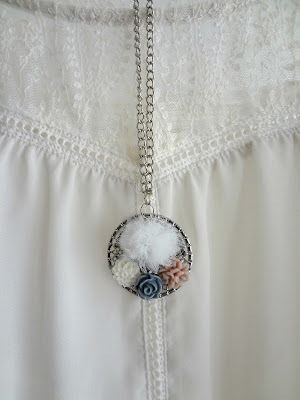 Again, what I am building as my signature piece - a Mori inspired necklace. 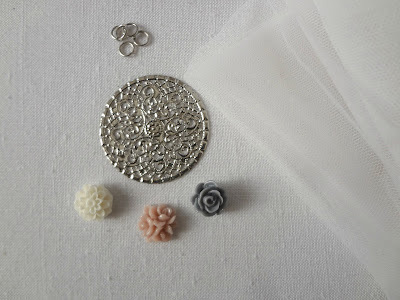 For this one I used a bluish grey Irish roses and taffeta rosettes sprinkled with pearls. I wanted to capture the very essence of the Mori style and aesthetic. I have some small changes and additions going on here, so this post is to give you the heads up. For quite some time I have had four new categories just below the header for easier navigation through the blog for those who come here looking for specific things. I think I managed to shape them up for now though blogger steadily and persistently tries to drive me crazy by messing up with the htmls now and then, so I guess this will be work in progress. 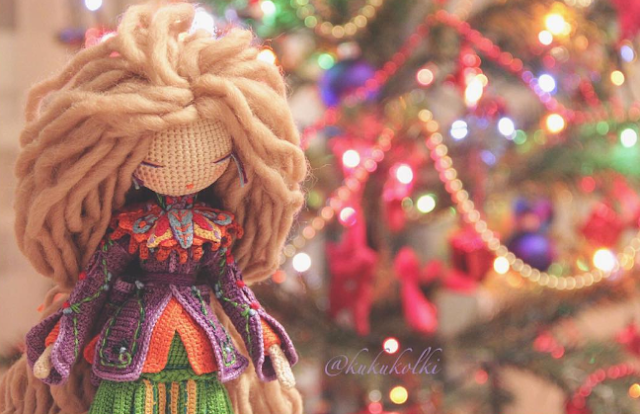 As I said there are 4 categories: Free Crochet Patterns, DIY Tutorials, Creative Ideas and Featured. Last week I added a Shop on the blog, so now you can buy my patterns directly from here. As for now, the shop only contains my digital crochet patterns; if it functions well I might add other categories to it. 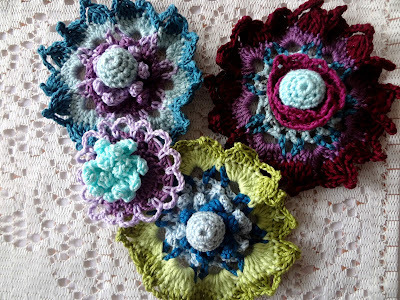 I also plan to add my free crochet patterns there so you could download those as digital files as well. 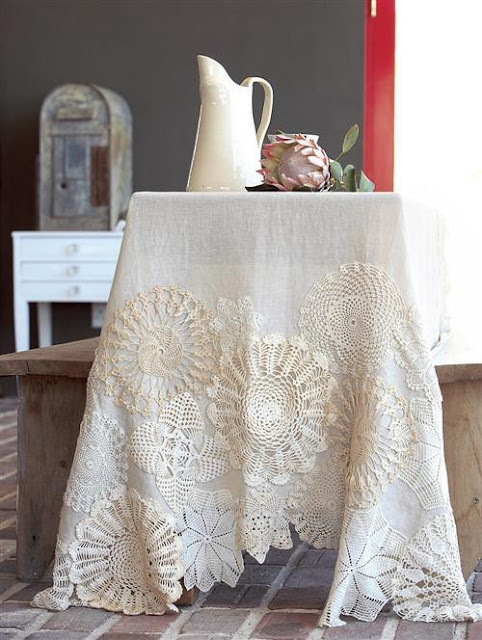 The chart for this lovely doily immediately captured my attention and I knew it will be the perfect one for my how to read series. Ch 12 and join to make ring. Rnd 1: ch3 (counts as the 1st dc) and dc 31 in ring. Sl st to end. Rnd 2: ch1, sc 1 over the first st (of the row below), ch3, skip 1, sc 1 in next st. Repeat pattern to end. Sl st to join round. Rnd 3: ch1, sc 1 over the first st (of the row below), ch5, sc 1 in next chain. Repeat pattern to end. Sl st to join round. Rnd 4: ch1, sc 1 on the loop where you ended rnd 3. Make 9 dcs in the next chain /loop. Sc in the next. Repeat this pattern to end. Sl st to join round. Rnd 5: ch1, sc 1 where you ended the previous round. Ch3, dc4 tog, make a 3-ch picot, ch 3 and sc in the 5th st. Repeat this once more to complete the "9dcs fan" of the round below. Repeat this pattern around. Sl st to join round. I used a different color for each round but I believe it will be beautiful in one color only too. 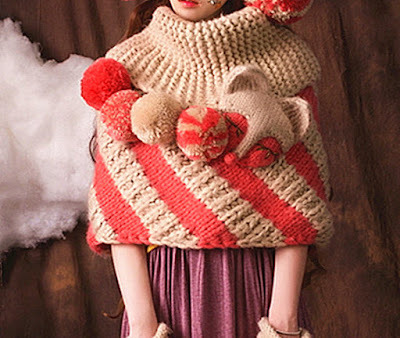 I was completely smitten by this poncho that appeared in my mori feed. I looked at it mesmerized and still couldn't believe my eyes. I said to myself that this is something I could wear until it wears out to the thinnest thread. Sans the ears that is. So I set in pursuit to find the creator of such gorgeousness and I found her. 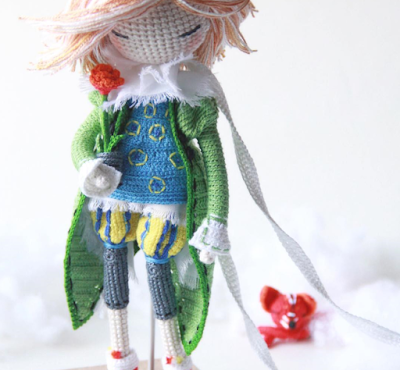 Her name is Daisy and she runs a fantastic, whimsical etsy shop filled with knit accessories. Her collection is called Forest Elves and she couldn't have named it more perfectly. 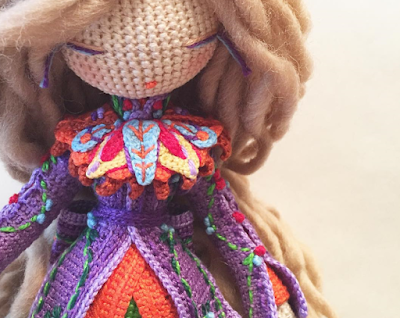 All her creations have an ethereal, otherworldly and mystical quality and she captures and emphasizes that feel by creating a fairy-tale like setting to showcase her creations. I do hope you pay her a visit!